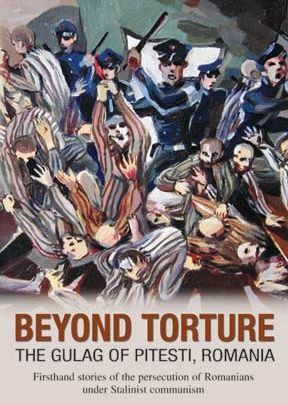 Beyond Torture documents the persecution of Romanians under the communist regime. You'll hear firsthand stories of the persecution of Romanians under Stalinist communism. These chilling words from two survivors of a brainwashing prison in Pitesti, Romania are sad reminders of the legacy of Stalinist communism. Beyond Torture: The Gulag of Pitesti, Romania documents the persecution of Romanians under the communist regime. Electrical shock, hallucinogenic drugs, near starvation and fatal beatings were daily rituals in the prison of Pitesti, Romania. But this sadistic story goes beyond torture: this was an attempt to totally destroy a people's culture and faith. In 1949, Stalinist Soviets began a systematic sweep of Romanian college campuses. Their purpose was to imprison and transform young Romanians into a communistic way of thinking. One prisoner describes this re-education as the most vile tortures imaginable. Orthodox priest Father George Calciu says, They tried to destroy our souls. But he and others survived this gulag, lived to tell their stories and even forgave their captors. In this documentary, you'll meet three survivors from the prison of Pitesti and see shocking paintings that capture the essence of the extreme torture. This DVD also includes an in-depth one-hour interview with Father Roman Braga: prison survivor and spiritual leader. Following World War II the Stalinist regime spread its brand of communism to the Eastern Block countries. The largest threat to its fulfillment was Christians and Intellectuals. This documentary is about the communists' attempt to reeducate a whole generation of Romanians through imprisonment and brainwashing. The first 35 minutes presents interviews with three survivors of the gulag at Pitesti, Romania. These men relate how they were arrested and tortured by their captors to make them renounce their faith and embrace communism. One man stated, "When you said, 'I still believe in God,' in five minutes you were full of blood," He and another interviewee are now Orthodox priests. The Pitesti gulag was open only 1949 until 1952, when the international community, having heard what was occurring there, forced it to close. Unfortunately, many of its prisoners were transferred to other prisons where their torture continued. The last 60 minutes of the documentary is an interview with Roman Braga. He relates how his faith sustained him during not only the torture, but also during eleven years of solitary confinement when he was allowed no book, pencil, nor paper. The communists thought that by depriving him of those items so valuable to an intellectual, he would become a beast; instead, his faith was strengthened....The topic is not pleasant, and as the DVD states, is not recommended for children. I believe that the documentary, which is the first historical documentation of Pitesti outside Romania, is appropriate for academic libraries. This DVD is the first major historical documentation of the Pitesti experience. The film is narrated by author and lecturer Jim Murphy. The oppression by Stalin in the Soviet Union began in Romania as WWII ended and lasted until 1949. Pitesti was a laboratory developed to create communist personalities by pressure, by torture, and by killing. The communist used brainwashed students to torture their own Romanian colleagues. Many became insane, committed suicide or died. Father Brage and Calciu felt artist Sorin Feraru captured some of what they endured with his commissioned work in 2001. The author's goal is a better understanding of torture to help rid society of it. Information about Pitesti was smuggled to the BBC, causing the torture to stop immediately because the Communist didn't want other to know they wer using torture. The communist condemned all the people in charge of Pitesti and executed them, thereby silencing them. Watching and listening to this video is not for the faint hearted. I do recommended this for adults and with the reservation that the torture described is vivid.